In the context of these uplifting celebrations which are so special for all the people of Malaysia, and for the veterans who fought beside them to defend their newly won independence, it would be churlish to reflect on the staggering contrast between the generosity of spirit demonstrated in KL as opposed to the mean-spirited atmosphere in London where members of the British civil service and government break the Military Covenant and treat British veterans and the Pingat Jasa Malaysia with contempt. Let us instead celebrate the success of Malaysia. We were there at their beginning ... a small group of survivors were there in the summer of 2007 to celebrate with the people of a country that has succeeded in developing a safe and secure, and prosperous, environment for its people. These are his photographs, his memories, in his words. My name is Terence Warner and I live Saundersfoot Pembrokeshire. My service career extended from March 4th 1952 until August 24th 1964. I served with the Royal Marines. My last commission was with the 3rd Commando Brigade based in Singapore and Kuching, Sarawak (Borneo) mainly. The NMBVA joined up at Heathrow Airport and were given a Dedicated Check-In desk where the formality of examining papers was dealt with very Rapidly - with a special marker for hold luggage (the reason will become clear later). During our time in the waiting lounge we were able to introduce ourselves and many of us have become friends. Among the Vets going was a gentleman who resides in the Royal Hospital, Chelsea. At this point I must say he looked splendid in his Red Coat. The flight with Malaysia Airlines was probably the best I've been on. The staff could not do enough for us. It so happens that the young lady, Maria, looking after my Section was from Borneo (yes I've got her Email address!). After a very long flight, departing London 12 noon and arriving K.L.I.A. at 07.00 the following day. This is where the luggage with the special label came into it's own …first onto the carousel! 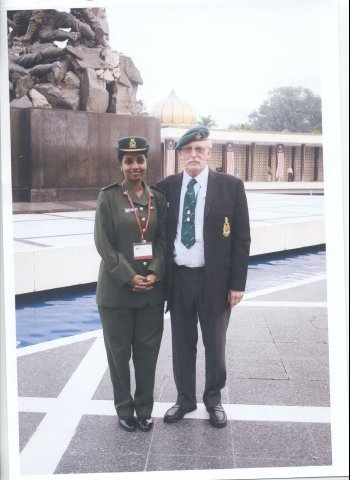 We were met by Col. Paul Edwards, the Military Adviser to the Malaysian Defence Force and by a Col. from the M.D.F. Imigration was a formality and NO customs! Now this is where the surprise came in, if Ron Blain knew about this he certainly kept it quiet … two pipers of the M.D.F. were there and piped us through the concourse. This brought the place to a stand still. Then as we progressed, two more joined in from the wings, so to speak, and yet two more. With the six pipers and the crowds cheering us it was quite a spectacular entrance. They in turn handed us onto four pipers of the Royal Tank Corps, who just happened to be in K.L. for a tattoo. They in turn led us to the waiting coaches. Wherever we went on official visits we were escorted by six police motor cyclists. These men did a wonderful job clearing the rush hour traffic. The guide who accompanied us gave us information regarding what we were looking at. Travelling over well surfaced roads some of the men realised that where we were was jungle when they served in K.L. Now it's a concrete jungle with high rise buildings and the jungle grubbed out with rows upon rows of palm oil trees to produce Bio Fuel. Gone are the rubber trees. There's no call for latex. Finally , after all the excitement of the antics of Malaysian drivers, we arrived at the four star Dorsett Regency Hotel. The first notable thing was the giant banner welcoming us. As we entered the foyer we were greeted by the manager and the entire hotel staff. Each and every one thanked us for coming back and for what we had done during the Malaya Emergency & Borneo Confrontation. The Navy ,Airforce and the Army were represented too, giving out our official badges and the programmes. At this point we had to wait to be allocated our rooms but this gave another opportunity to meet those we'd missed at Heathrow. After a nineteen hour flight - seven as they are ahead of us in G.M.T. many were beginning to feel the strain, but it was worth it as the rooms were well appointed. I was to have had a deluxe single but ended with a deluxe double. Showered and fed it was time for the briefing. Here Col. Paul Edwards and Lt.Cdr. Martin Davis R.N., with other senior military Malaysian officers, took us through the coming programme. Following that I, for one, headed for my bed as the following morning there was a early start. Pick up 07.00 for our visit to the National War Memorial. Very large, very impressive and spotlessly clean, the noisiest thing were the clicking of camera shutters. In the ceiling in the Colonnade are the Regimental Badges of every regiment and corps that served there during those dark days. Major Shera on the evening she was escorted to Dinner by a well known RM veteran, writer of reports, and erstwhile photographer! and two doctors, who were Captains, and two para-medics. Unfortunately Dr. Faira was called upon as Ron had a nasty fall. Thank goodness his injuries was limited to a grazed leg. each that were attached to the MNBVA throughout our stay. They were based at the hotel with us. Reception had her room tele.number in case of emergency. The next big event that day was the gala lunch and presentation of the much talked about Pingat Jasa Malaysia medal by The Right Honorable Dato Sri Mohd Nabib bin Tun Haji Abdul Razak, Deputy Prime Minister and Minister for Defence who spoke to each of us, shook hands, asked when we were there and where, thanked us for what we did and pinned on the PJM. This all took place in the magnificent ball room of the Shangri La hotel. Although not counted my guess is that there were 500+ at this occasion. Prior to the presentation the minister gave an "off the cuff” speech concluding by asking us to wear the PJM with pride. This was received with a cheer and loud clapping from us all. We will wear it with pride . As we did for the Merderka parade. The entertainment was provided by the Cultural division of the M.D.F. and was spectacular. The room gave them a warm round of applause, they deserved it too. 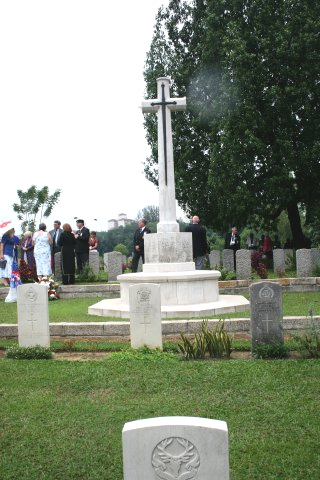 Next stop in the itinerary was a visit to the military cemetery at Cheras Road. 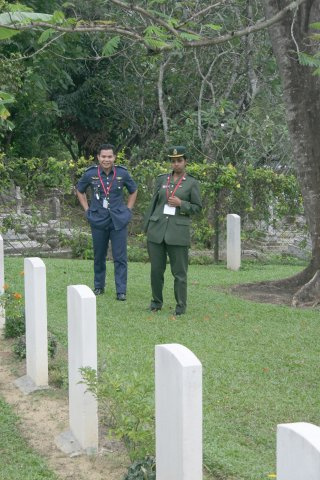 In silence we looked at the head stones, one Vet had two mates buried there. It was the first time he had seen the graves so it was a nostalgic moment for him. and a Cpl. 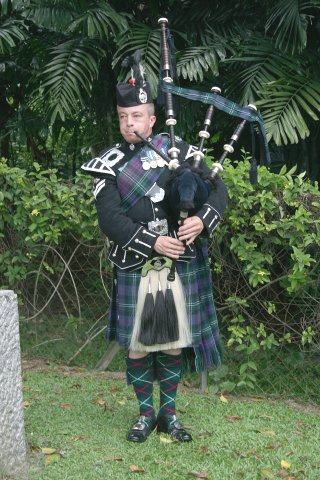 Piper from the Royal Tank Corps played the lament “Flowers of the Forest” – it was very moving. The war graves commission and the two local grounds men must be congratulated for the way the cemetery is kept. Back to the hotel, a few beers and bed early start again on the 31 st.
Breakfast at 5 a.m. is a bit of a shock to the system and then off to the head of the parade. The early start is explained by the fact the police closed all roads and anyone not there was "locked " out. Also, with 25,000 taking part, the organisers wanted everyone on their marks. All those taking part were in a carnival mood, many wanting their photographs taken with us, and taking photos of us too. Personally, I did not march so I was able to get the photos I have submitted to the Fight4the PJM. From my advantage point I was able to witness the arrival of the heads of State from most South East Asia countries. The whole thing was the most spectacular and colourful event any one would want to see. At the end of the 300 or so metres of the NMBVA march there was a grandstand where everyone was reunited with their wives. This gave us a terrific viewing platform. When the parade was over we were inundated by the crowds wanting to talk to us, take photos with their families … it was carnival time all over again. The interesting thing was that nearly every one thanked us for what we did for them, some so young that I think their parents must have been quite young themselves. Nearly forgot … as each contingent marched passed the King they were introduced to the vast crowd. We were introduced as Freedom Fighters. The roar from the spectators was almost deafening. Finally we were "dragged" away from photo calls and re-bussed for the reception at the High Commissioners residence. The Duke of York was there but very few of us saw him so perhaps the least said about that the better. At the residence Sir Garry presented a framed gold Kris to Ron Blain on behalf of us all who undertook this unforgettable journey. The cost of this present was undertaken by us all. The following days saw the group break up. Some to Singapore others to Ipoh and Penang. To complete this report I think I speak on behalf of us all when I say, To all who organised our stay, the hotel staff, the police, all the military representatives and especially the two Doctors and their para-medics, on behalf of the NMBVA our grateful thanks, BUT my personal thanks go to Shera (I don't know if the party noticed but Shera and I became good friends !!!). it was a pleasure meeting you all and my thanks for your company. 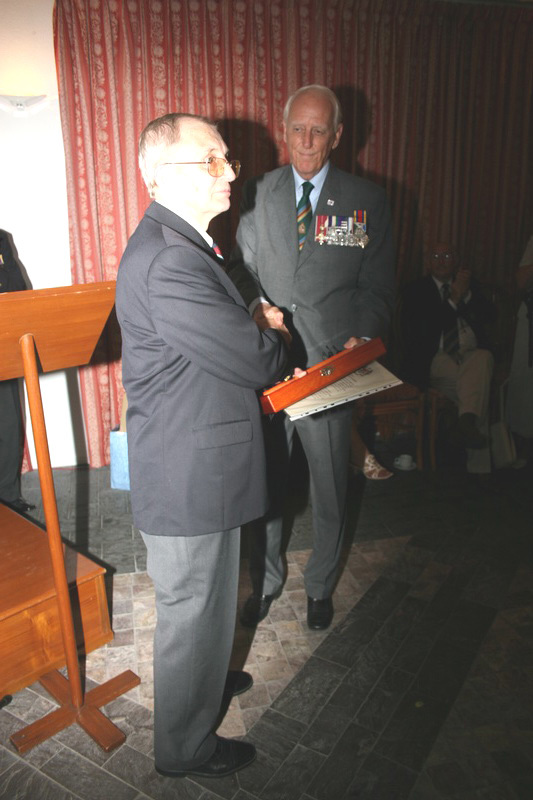 Terence Warner, Secretary of the Carmarthen Branch NMBVA. PS. I was in Kuching for the 5th Merderka … now back for the 50th … I wonder where the time has gone. ...Grateful thanks and congratulations on producing this wonderful record of what was undoubtedly an unforgettable trip...you have permitted those of us, not privileged to accompany you on this occasion, an opportunity to enjoy the experience vicariously. ...Thank you for so generously honouring our comrades in such magnificent style...there are thousands more of us, all over the globe, who remember your nation and it's peoples with great affection....Your generosity and courtesy do not go unnoticed. 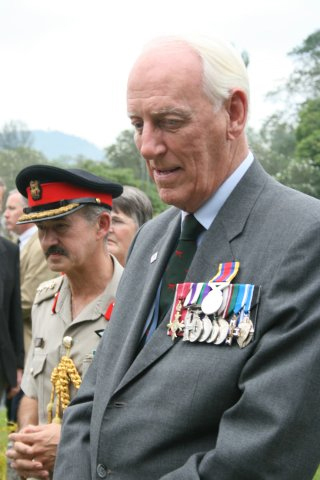 Comment =I served with 3 Commando Brigade RM in Singapore and Kuching and had to wait 42 years to get my GSM after a "battle" with Derek Twigg MoD and involving my MP too. On the 30th of August 2007, and just 5 days after my 73rd birthday, I recieved my Pingat Jasa Malaysia medal from the Duputy Prime Minister and Minister for Defence in Kuala Lumpur. Comment =Thank you Terry for sharing this with us. The reception given by the Malaysian people is beyond words. What a display of friendship and appreciation in a world full of hate and injustice. We could all learn from the marvellous Malaysian people, especially the British government. I think you should share this with the world and produce a soft backed copy. Comment ="The reception given by the Malaysian people is beyond words." said Andy. Indeed it was - and in stark contrast to the buttock-clenching, mean-spirited, ignorance of those in the Cabinet Office and elsewhere in Government and the HD Committee who have promulgated their view that the Malaysian medal is sub-standard! It beggars belief. 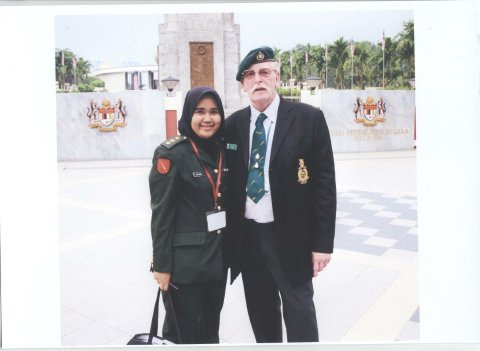 I am with the Malaysian Government and People, and with veterans like Terry and Andy and my former comrades-in-arms. People I respect. I have now sent my PJM to the Master Tailor for inclusion on my medal bar and I shall wear my PJM with honour in the full and certain knowledge that I now have permission to do so from all those who matter. PS: The Malaysian Deputy presented me with my PJM in London in July 2006. I was able to tell him I knew his late father, Tun Razak, and that we had spent three days together in difficult circumstances in 1966 - I was on 'official' duty. I was able to tell him that his dad was very proud of his young son. At the presentation he noticed my Fight4thePJM Lapel Pin. He said nothing, of course, but I am sure I detected a look in his eyes and a tightening of the grip when we shook hands. Comment =Terry's report and images, and the above comments, make me feel very proud. Proud of being a Malaya-Borneo veteran and proud of being a Fight4thePJM supporter. The Government and civil servants have simply lost the plot and, in so doing, have lost any allegiance I ever had. I was a volunteer and I think I made a good soldier and served for 12 years with teeth arm units. Would I volunteer now? No bloody chance. Not unless my country was directly threatened. This shower of dysfunctional and hypocritical civil servants, and the spineless Ministers they lead, have never served themselves and do nothing to encourage men and women to serve. And the worrying part of all this is that I believe that that is exactly what they want to achieve. Thanks to everyone but especially thanks to the Malaysian people for not forgetting us. You did us all proud, well done! Your sentence says it all: "Nearly forgot - as each contingent marched passed the King they were introduced to the vast crowd. We were introduced as Freedom Fighters. The roar from the spectators was almost deafening". Comment =Magnificent suff, Terry, and so poignant. I arrived "up country" at Batu in 1957, just as the original Merdeka celebrations were ending, and as a National Service soldier stayed until 1959. Along with the above Andy Nicoll and a number of other vets I had the pleasure of attending the Malaysia in Edinburgh Pavilion on 27th Aug where we got a wee taste of the real thing you experienced. Although we were not covered by HMQs medal amnesty we all, from privates to Brigadiers, wore our PJM with PRIDE, and were thanked for doing so by a Malaysian Government Minister. Many thanks for the wonderful narrative and photos. I was unable to attend the celebrations, but having served in Singapore and Kuching during Confrontation, I was interested in learning of the generous hospitality from your Hosts. The next best thing to being there was to read your words. I found them both informative and emotive - such reactions from the Malaysians brought a tear to my eyes. Thank you for your efforts. 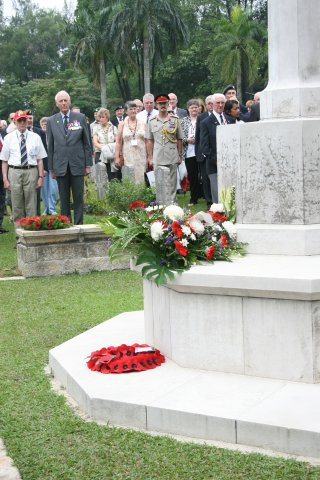 Comment =As the wife of a Borneo Veteran, may I thank Terry for the beautifully crafted report on the KL celebrations. I have followed the campaign for 2 years and I am disgusted at the way you chaps have been treated by our administrators (have you noticed how similar is adminis-trator to traitor?) They are traitors to the sacrifice made by you all. I'm so pleased that the Malaysians showed such feeling towards their guests. Honour does still exist, even if it is no longer apparent amongst our so-called leaders. Comment =I have just been sent this link and read this story and the comment by one veteran's wife. I am very, very angry. My husband also served in Malaya and Borneo and also in Indonesia. 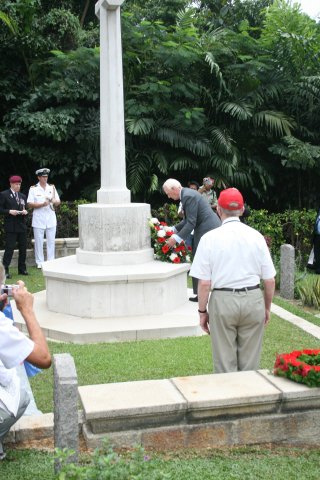 The government will not want to remember that it sent British troops illegally into Indonesia but they did. Those men and all veterans from Malaysia did this country's dirty work and now they are being treated with contempt. Some were conscripted and have nothing to show for what they did. Denis Brennan and the members of the Honours Committee, and this government, should be ashamed of themselves. They won't be of course. That would take a little bit of humility. All they have succeeded in doing is to cast doubt on the the role of and reason for the Monarchy in the modern age, and to demonstrate to the world at large that this country is on a slippery slope as it languishes in the dying remnants of an imperialist past that is supported only by people like the Honours Committee. I thought that the Labour Party had different credentials. Apparently not. Let me end on a positive note because this story is all about good things, about honour and never forgetting and about a gracious people. Thank you, people of Malaysia, for not forgetting what our men and women did. Thank you Terry for your story which I thought was wonderful. 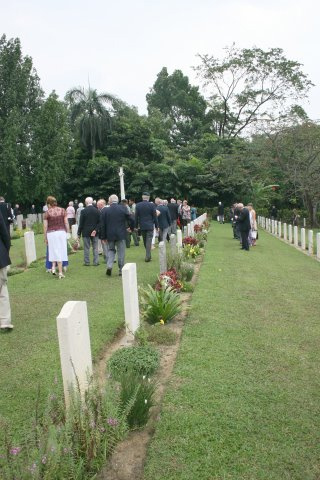 Comment =It must have been a memorable and nostagic return to Malaysia for British veterans. I couldn't make it. I wish had been able to. Thank to Terry for the pictures and to the people of Malaysia for their graciousness and dignity.